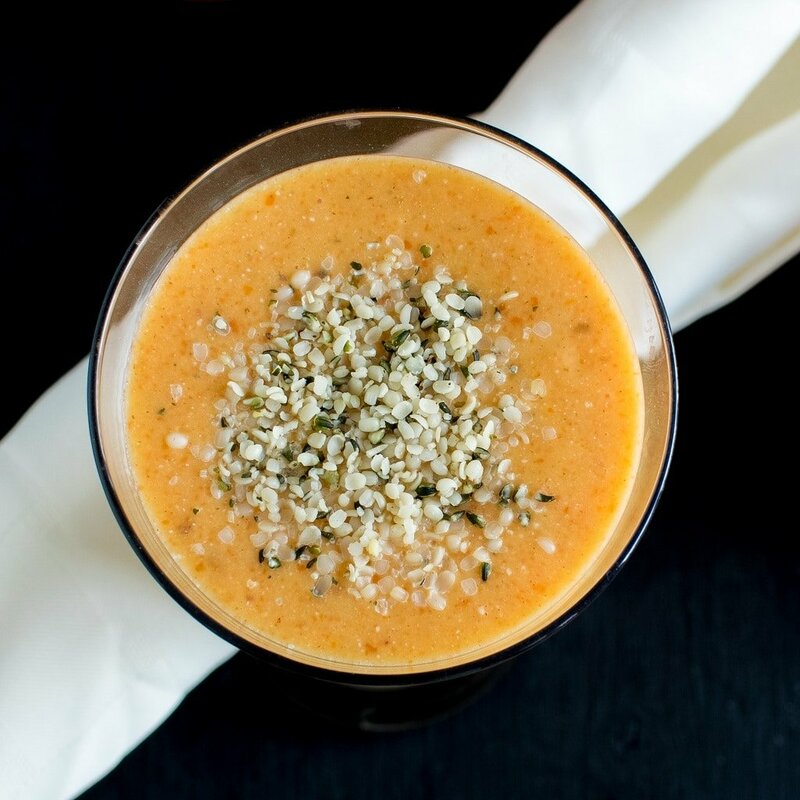 Persimmon Carrot Hemp Smoothie is a low calorie yet a satisfyingly hydrating beverage. It’s a perfect energizing drink after workouts. It’s also a refreshing evening drink or a nutritious breakfast. All in all it’s a versatile beverage that’s vegan and gluten free. 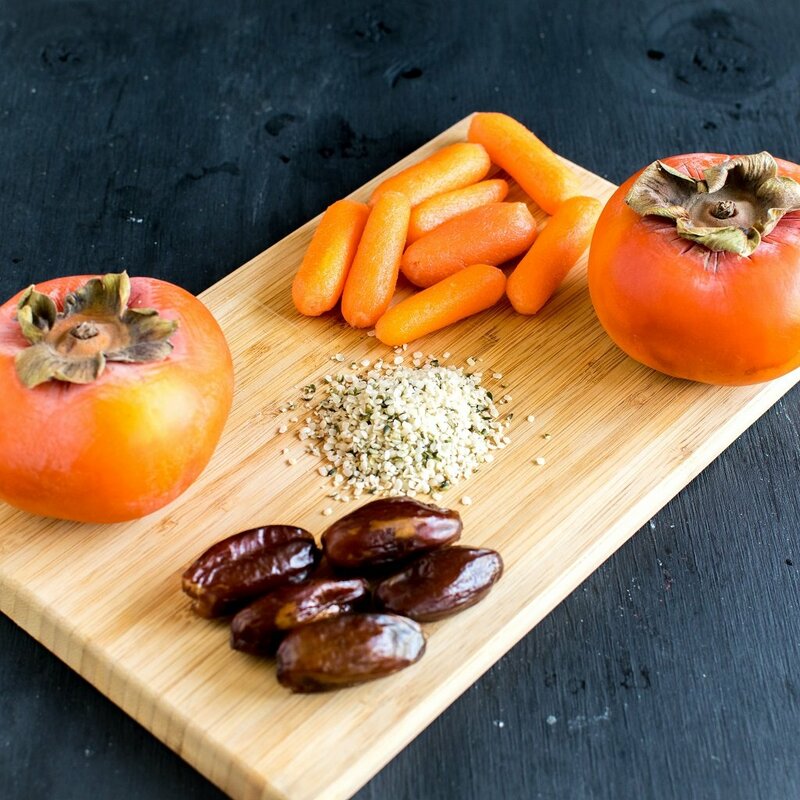 Persimmon Carrot Hemp Smoothie is protein rich along with being high in potassium. It is also a good source of vitamin A and provides the much required fiber. It’s thick and slightly chewy satisfying the desire to eat as well as drink. Moreover it’s my husband’s favorite after workout energy drink. I came up with this smoothie because I myself wanted to take a break from all the indulgent foods during the festivals. Even though I am a foodie and I loved to dig into everything around myself, I still craved for something light and nutritious. When I peeked into my refrigerator I found few juicy persimmons hiding. I love persimmons and I never leave any opportunity to stock my refrigerator with this wonderful fruit during the season. Next, I looked for carrots and I found a bunch of baby carrots. Immediately, I got an idea to come up with an orange colored smoothie but without oranges. I needed to add some protein to my smoothie but I ran out of my favorite hemp protein powder. Just when I was about to give up I happily found hemp seeds in my kitchen pantry. I definitely had dates and almond milk in my kitchen. My smoothie recipe was born. Now, I just had to practically blend it. Excitedly, I combined all the ingredients in the blender and blended it into a smoothie. It looked beautiful and divine. As soon as we sipped into our smoothies my family loved it immediately. It’s been 3 days now and I blend this Persimmon Carrot Hemp Smoothie every day. It’ our latest craze. So, I would recommend you to get started and blend this smoothie ASAP. You won’t know its deliciousness until you blend it yourself. Lastly, pour the smoothie in serving glasses. The, garnish with more hemp seeds. 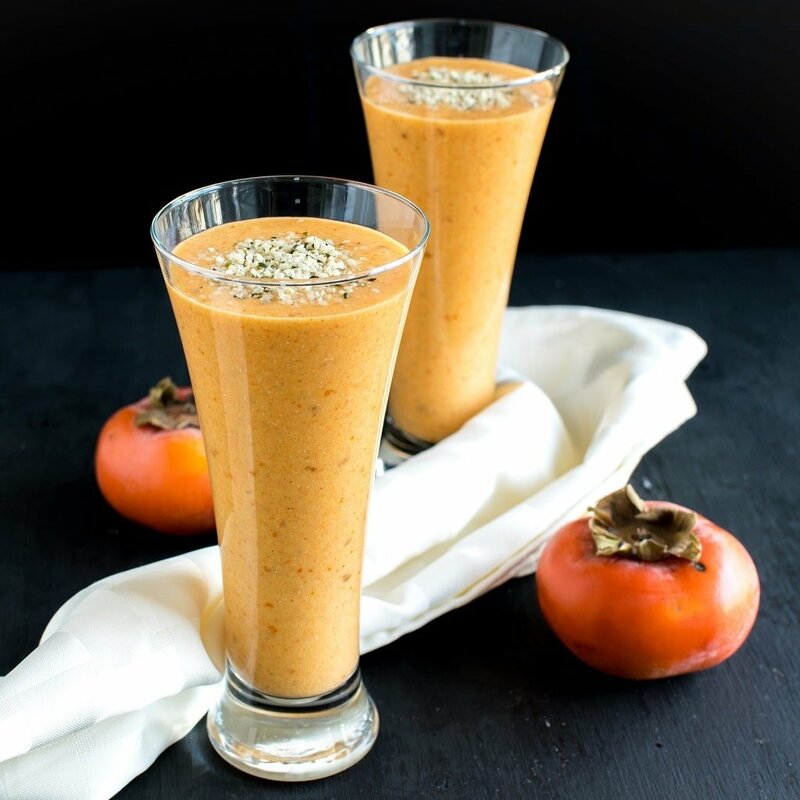 Make sure to use ripe and sweet persimmons for this smoothie. Incase if persimmons are not very sweet you may increase the pitted dates up to 7-8 as per your taste. This looks like a great smoothie to start the day with! I love packing these to work with me in the morning. I love smoothies too especially when they are packed with veggies and fruits and are naturally sweetened. This sounds delicious and definitely different than my usual combination. Thanks for the great idea. Thank you Elise. My blog themes around unique combination of ingredients in a recipe. I like your combinations, I would never think of combining them together but it looks amazing and I can imagine how delicious and nutritious this is. Its a must try Joan. This smoothie is simply delicious and delectable. This looks actually interesting. I loveeee smoothies, so I will definitely give this recipe a try. Let me know how it turned out for you Toni. This sounds intriguing! I have never had persimmons before. In the past I told myself that I would try a new food each month, but haven’t followed through. Maybe this year is the year to stick to that resolution! Yum! What a delicious combo!! I can’t wait to give this smoothie a try!